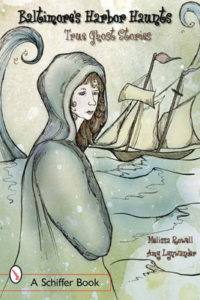 Baltimore’s Harbor Haunts: True Baltimore Ghost Stories by Amy Lynwander and Melissa Rowell (owners of Baltimore Ghost Tours) was published in 2005. This book covers many of the stories on our Fells Point ghost tours. It is available from our publisher or on Amazon. Baltimore, Maryland, has harbor neighborhoods that have a long and colorful history of industry, immigrants, and ghosts. This spellbinding book exposes some of their unknown scary histories. From the ghost of a drowned boy in Canton to the famous haunts of Fort McHenry, tantalizing stories pay homage to the people who remained behind. Meet the more “spirited” residents of the Canton, Fell’s Point, Inner Harbor, Federal Hill and Locust Point neighborhoods. First, meet the ghost with a favorite polka on the juke box. Then, there is the lady who rewards cleanliness with money. This spooky volume is not to be missed.